Not exactly breaking news, I know, but we don't often think about where the most basic of our kitchen staples come from. By now olives harvested from trees and pressed into oil is a well-trod story. But what is vegetable oil made from, exactly? How do you get oil from corn? And what is canola, anyway? 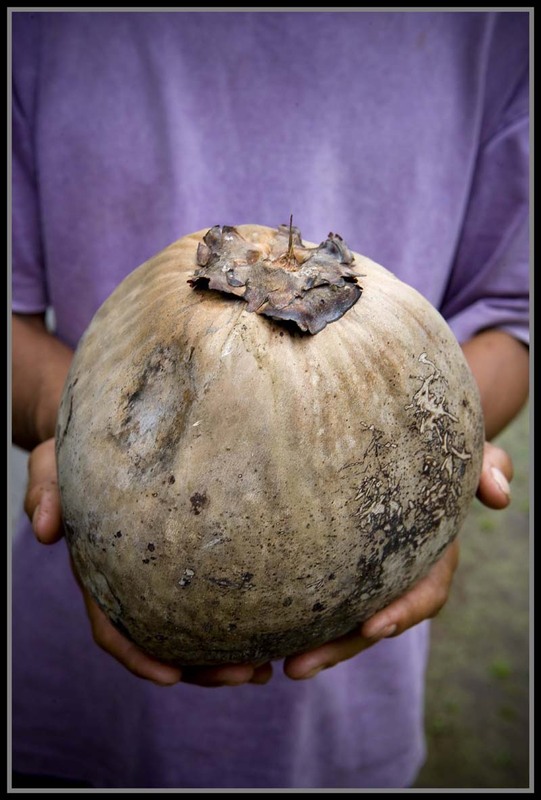 All worthy musings, but today it's the humble coconut to which we turn our attention. On Bali we spent a couple days watching, cooking with, and photographing two local cooks. Ibu Nengah and her husband are renowned for their kitchen prowess; they're hired by folks in the area to prepare feasts for weddings, birthdays, and other festive occasions. One morning they showed us how to make coconut oil. 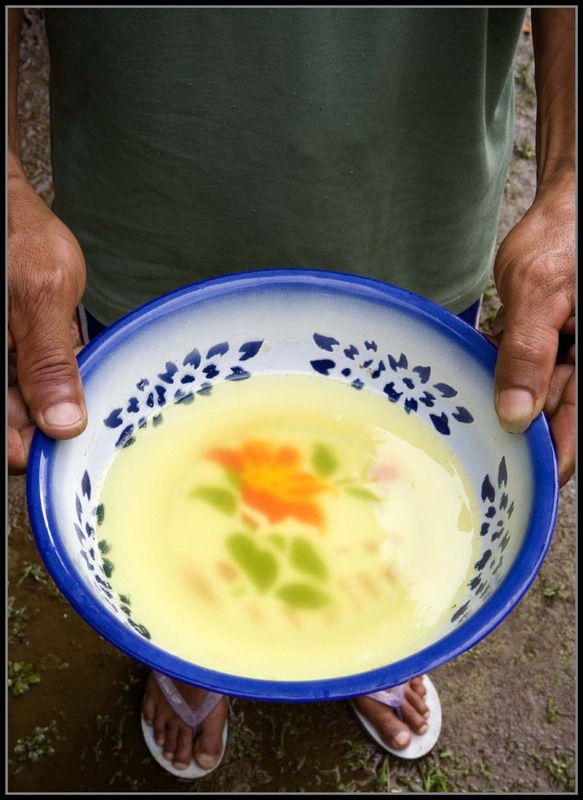 Ibu Nengah says that, time allowing, they prefer to make their own oil because what they can purchase at the store just can't match the homemade version for flavor and fragrance. 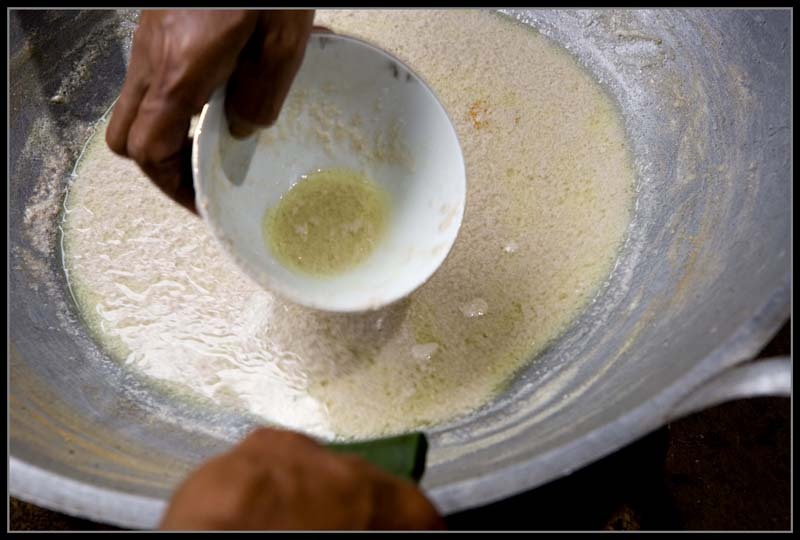 The coconut oil-making process is relatively simple, if time-consuming. It starts, unsurprisingly, with coconut meat, here grated by hand with a nifty tool that consists of a board sprouting rows of nails. 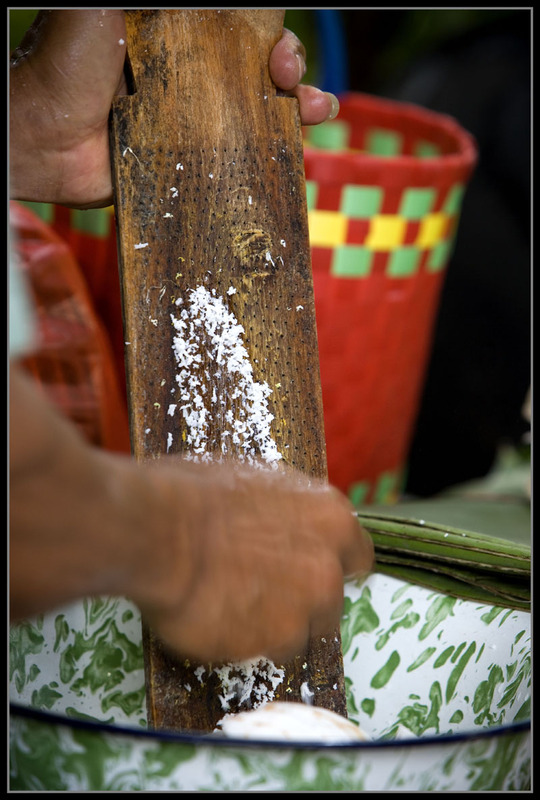 Actually this homemade grater reduces fresh coconut into fine shreds much more quickly and efficiently than a Western-style metal grater. 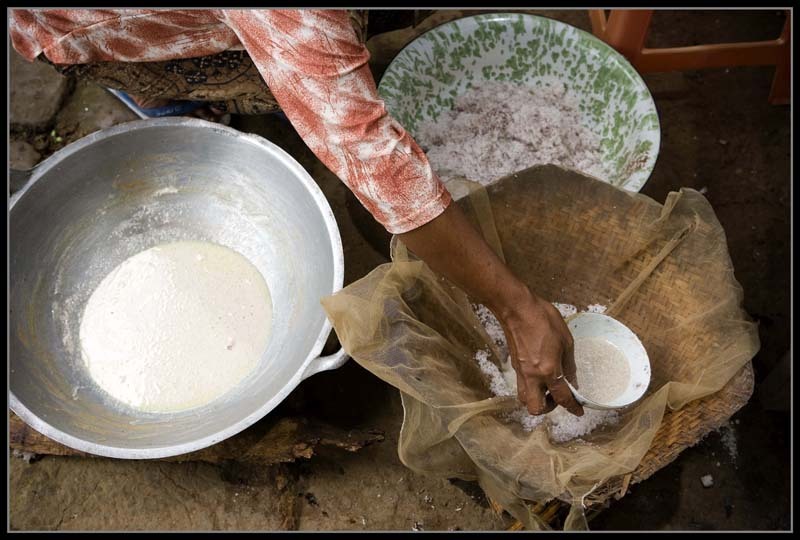 Hot water is added to the grated coconut, and the mixture is stirred until it cools, at which point the coconut is squeezed - hard! - to get it to release as much 'milk' as possible. 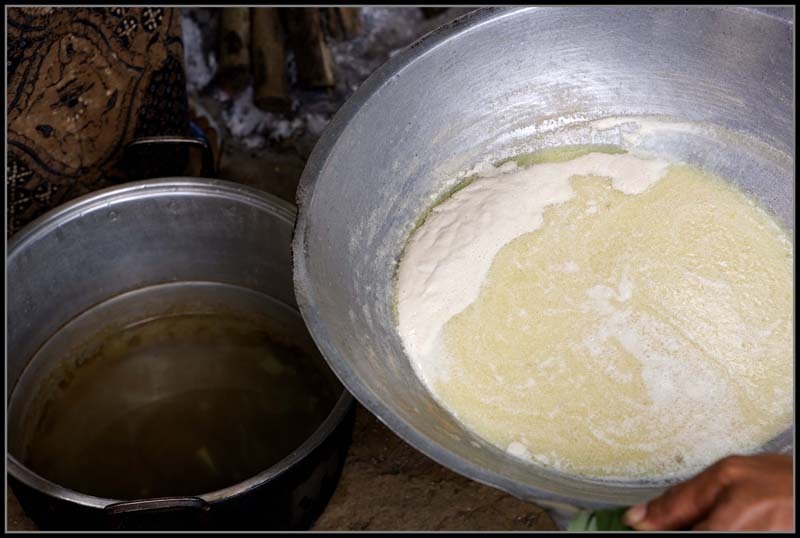 This is the first pressing; more hot water is added to the squeezed coconut meat and the process is repeated. Three coconuts produce about 1.5 liters of coconut milk. 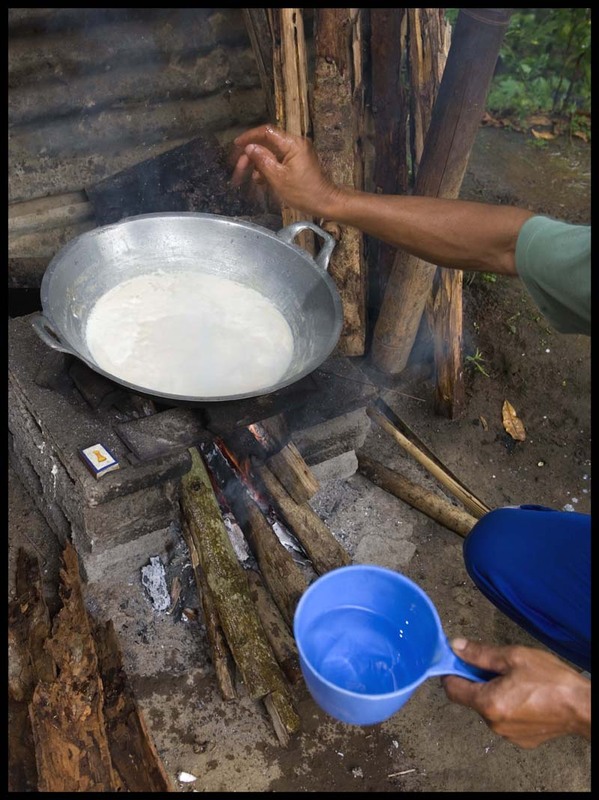 The coconut milk is put over a good-sized fire and is left to boil briskly. Two coins of turmeric are added (and removed about an hour later). 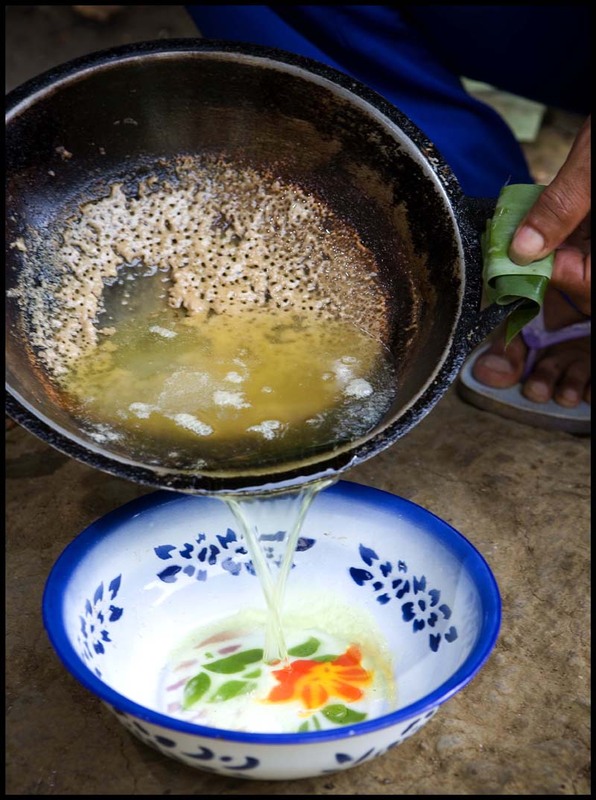 The turmeric colors the oil, and Ibu Nengah says it keeps it 'fresh'. It probably adds a bit of flavoring as well, which doesn't much matter because just about every Balinese dish that coconut oil might be used in includes turmeric as an ingredient. After about an hour foam forms on the liquid's surface yellowish fat starts appearing around its edges of its surface. 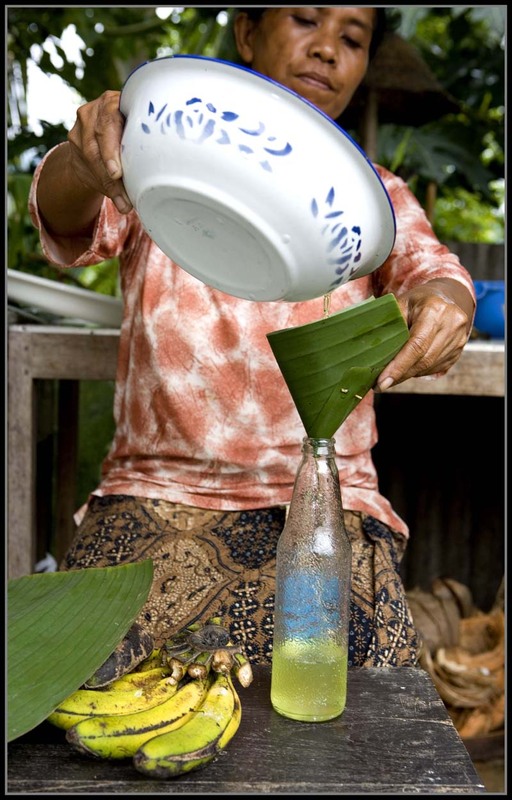 Ibu Nengah's husband sprinkles water on the coconut milk's surface - to further draw out the oil, he says. 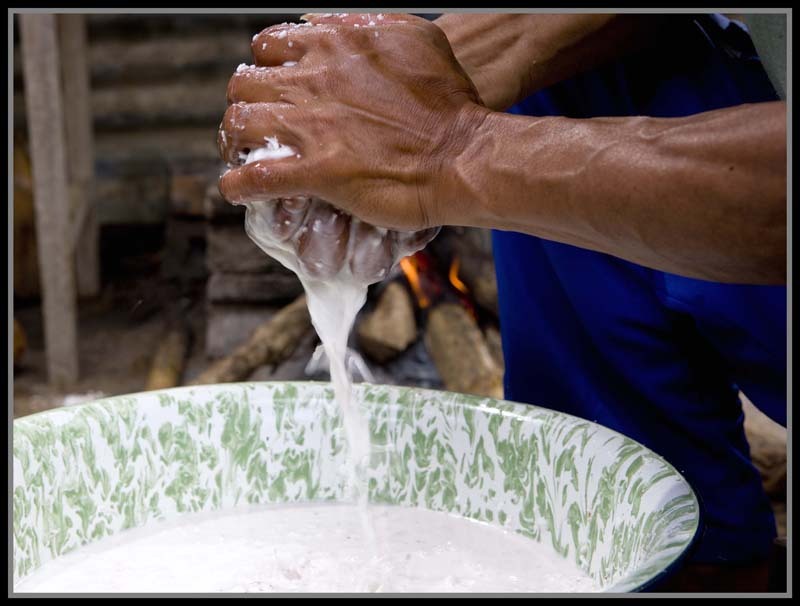 By the time the coconut milk is pulled from the heat (about one and a half hours) it's been reduced in volume by about one half, the foam has dissipated, and its surface is covered with a thin cap of golden oil. 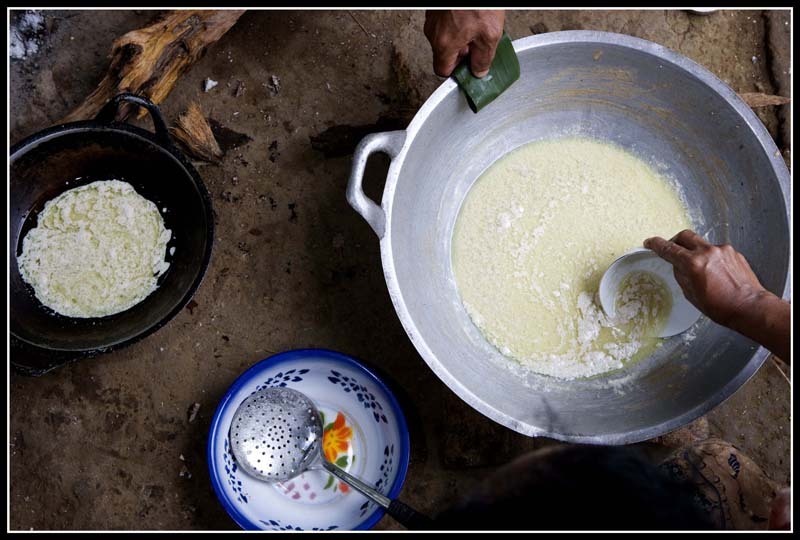 and then returned to the pan and left aside to allow the coconut milk solids to settle. 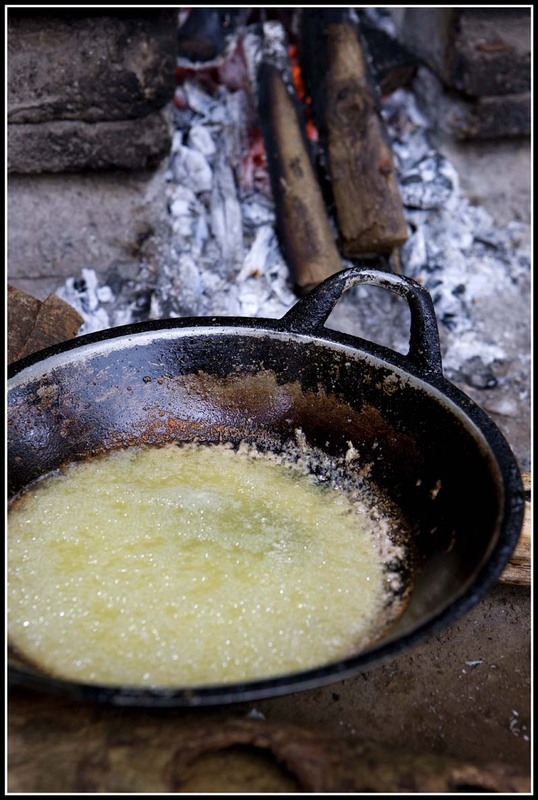 (If you've ever clarified butter these steps will sound familiar.) 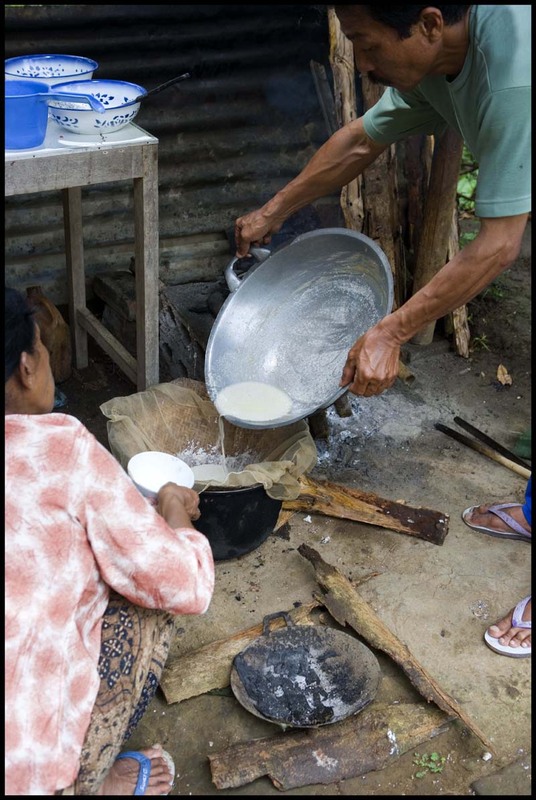 After about five minutes Ibu Nengha and her husband use small bowls to skim the oil from the surface of the pan. and transfer it to a smaller, heavier cast-iron wok (above left). What's leftover in the big pan after skimming is set aside. but after just a few minutes the bubbles fade away to reveal nearly clear oil. 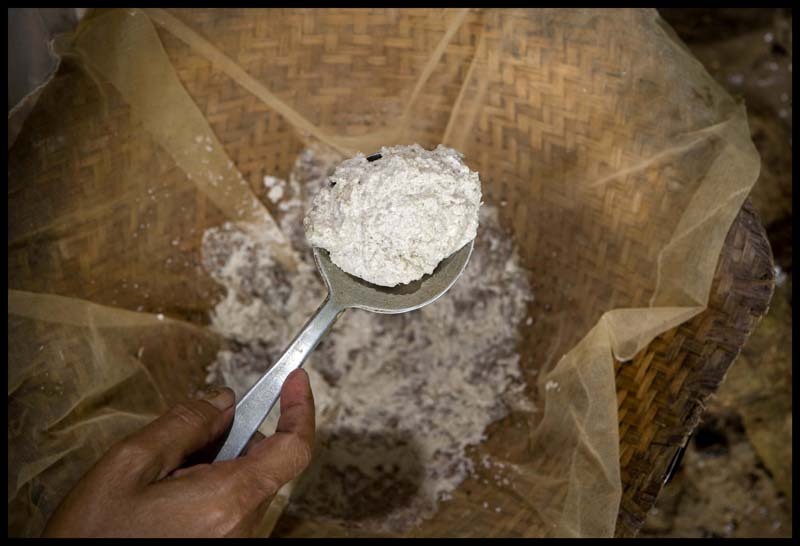 Now Ibu Nengha places a plastic mesh cloth over a woven basket, sprinkles it with a bit of grated coconut meat (to create a finer sieve), and scrapes in the mush left in the black pan after the oil's been poured off (above). To this she adds any further oil that's surfaced after the first boiling (below), transferring it to the sieve with a small bowl. Then she scrapes and presses the mixture with a spoon to retrieve every last drop of oil. What's left in the basket/mesh sieve is a wickedly unctuous coconut-flavored, slightly nutty sludge. It will be eaten as a sweet snack, just a spoonful at a time (it's delicious but so rich that more than a spoonful is out of the question), or stirred into rice to eat with other dishes. All that effort and time, and 1.5 liters of coconut milk, yields one small bottle of oil. But it's by far the best coconut oil we've ever sampled, and the scent that fills the kitchen when I heat it in a pan makes us think of Ibu Nengah and her husband, their tranquil outdoor kitchen, and the clove and coffee tree-swathed hills of northern Bali. I'd be afraid of the grater, though. I've scraped enough knuckles with regular graters - can't imagine doing it on one with nails. gorgeous pics.... reminded me of your butuan outing. how come i haven't seen either a photo of one of you guys in this blog eating all those food? what a useful information ! What a wonderful post! I love knowing how our food comes about. Thank you! That looks like such as intensive process - I wish I could taste and smell the final results! How coconut oil (and for that matter, most other oils) is produced is something that I have never really thought about, and Im glad to learn about it here. Beautiful pictures! Rather than teaching people about food, you teach foodies about food. Keep em' coming! Thanks for a very educational post. 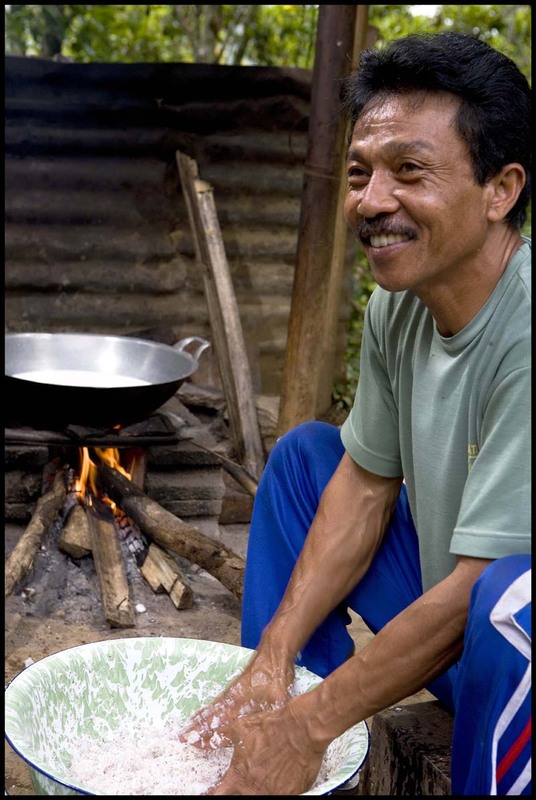 That's the authentic way of making coconut oil, all right! 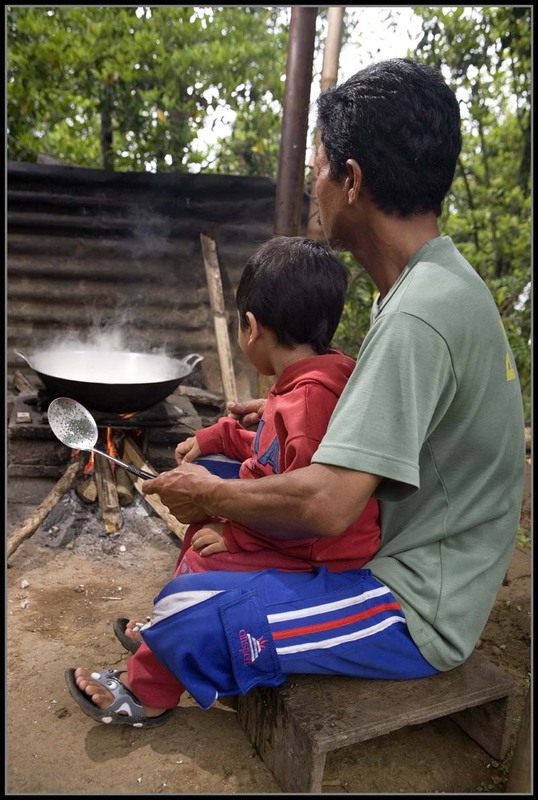 I especially like the picture of the boy sitting in his father's lap, watching the milk boil. I can almost imagine myself there, smelling the coconut milk and listening to the the wood fire crackle. I attended a seminar a few years back on how to process virgin coconut oil (cold press and light heat press). It's now become such a niche industry and a lot of people tout its virtue for health, beauty and cooking. We had to learn how to grate and then cook then filter the oils in large quantities. The sludge you photographed, as Santos noted above, is also cooked till brown and nutty, then topped on many a rice cake. We call it latik. Super tasty and super good in all sorts of desserts. As basic as this seems, it's ground-breaking work. We can move on to discussing other aspects of coconut cookery only when such a foundation is set (and surprisingly, no one's really done it before). 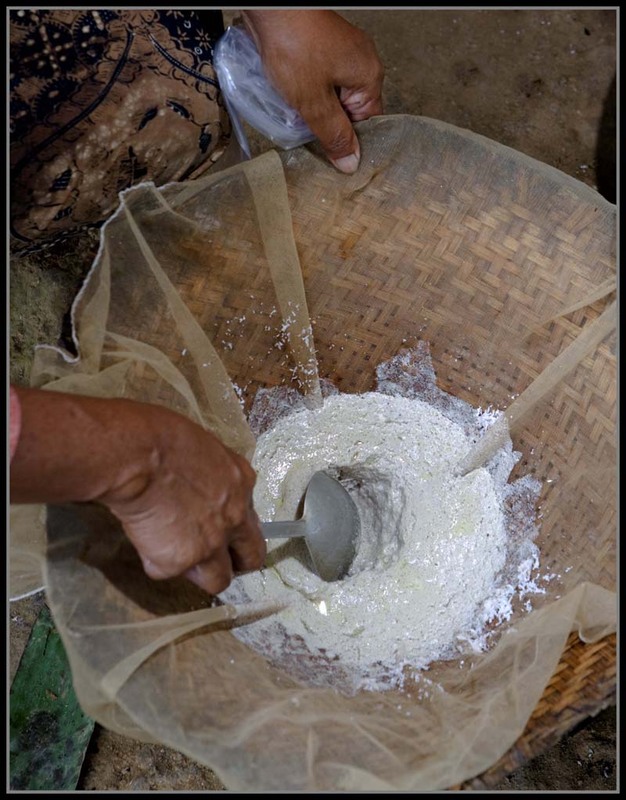 For instance the nature of the "latik" mentioned above (this is one of the most beloved components of a number of Philippine rice cakes) can only be understood in the context of the science of this separation of oil from solids. 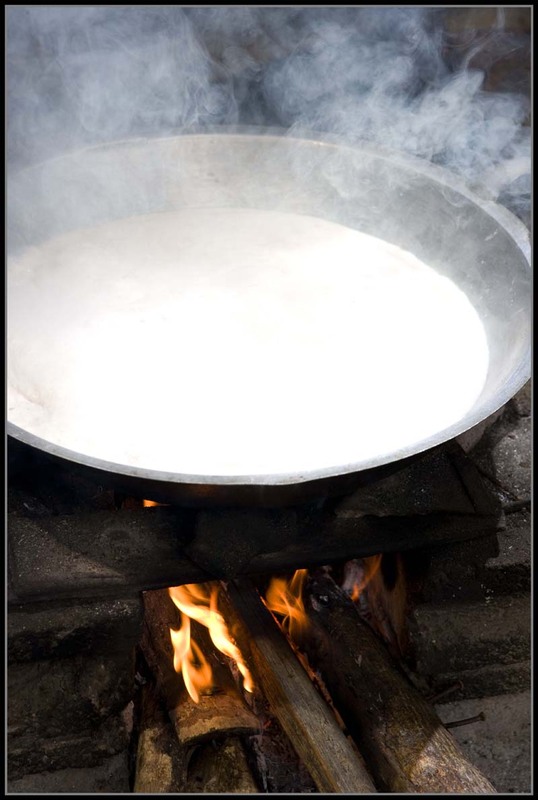 Curiously, it also makes me see better why Lucia, the cook in the Medina household in Arayat (see old posts on eatingasia on Pampanga) is extremely scrupulous about letting the coconut oil float up to the surface of her coconut-based stews. Just got my hands on the May issue of Bon Appetit and there was mention of your work. Wonderful! Congrats! Susan - I've had one in the drawer for a couple years but I'm afraid to use it! juls - we're not the story, the food is. go, dp, and m - thanks. we enjoy doing these sort of 'process' posts. luckyfatluke - making bplaa raa in the UK! Now that I would like to hear more about! Nate - that's my favorite too. It was actually a little cool that day, with the occasional spot of rain ... the wood smoke smelled great. Mila - can't imagine putting that stuff on a dessert, it's already so rich on its own. But I know what you're talking about -- it didn't occur to me that this sludge was the substance crowning many PHI kakanin. RST - don't know about ground-breaking, but I'm glad many found it interesting. Mm, I'm so curious to try a spoonful of that coconut sludge. Thank you for sharing this -- wonderful! while I doubt I will ever get around to trying it myself, I like knowing about the process. Reminds me we can cook without bottles, cans and jars of stuff. Who knows, tho, I might tackle it at least once. That coconut he's holding doesn't look the brown hairy critters in my supermarkets! Fresh coconut isn't eaten much in my house due to the challenge of cracking it without losing a hand or finger...or worse. Fascinating process! Pictures are worth a thousand words. I'm just starting to learn about the benefits of coconut oil and am experimenting with recipes. Don't think I'll start making my own oil, though! Vera, the brown hairy thing is inside! bayi - I think it's true that all over the world folks take the details of their own cuisines for granted. Love the pictures. You catch what the real life is. Great work. This is a most thorough and detailed description of the process and is both informing and accurate. This is how we do it in nearby Lombok and the process is pretty much the same world over. Some people are better at it than others and will get better yields from the same coconuts. Here we often put in a little ginger for a denser colouring. I thought you might like to know that one of these photos is being used elsewhere. Wow that is a lot of hard work. I wonder if anyone has designs on a simple, cold press machine that would reduce this amount of work for individuals or villages in remote locations. Coconut oil is the most pro-thyroid fat you can eat. It has helped many people lose tons of weight. It protects you from the danger from polyunsaturated fatty acids. It helps stimulate progesterone in your body. It's super good for you. I love it's anti fungal, anti bacterial and anti parasitic properties. It's not just a food. It's a healing food. Thank you so very much for this recipe. During my exploration of nutrition, I discovered nature's gem, the coconut. Wow, do I ever love it. I mean, I. Love. Coconuts. I had only ever had coconut "flavor", or shredded coconut on a macaroon or something. Never liked it. In fact, tried to avoid all coconut due to the taste. Then, was tempted to try a can of coconut water; so incredibly gross, like drinking the sweat squeezed from a high school football teams' socks. Really. But, I have seen people on tv drink coconut water and they seem to love it. So I went for it and bought a coconut. Never done this before, so I wrestled forever trying to poke through the wrong eye, lol. Upon first taste... whoa. Ok! It was so good, I could feel my body absorbing it immediately and the sensation I can't describe. The taste of fresh coconut meat... I could live on it... delish! You can taste the oil content, and I have been trying to figure out the best way to extract it. My exact thinking was, "I bet the jungle tribes know how to extract the best coconut oil." This is the beauty of the internet. Truly. I will be performing this extraction in my kitchen. Thank you!!!!!!!!!!!!!! Namaste!! !